Lawrence of Berkley and I had a little shooting expedition a few weeks ago. I was testing the new AF-S NIKKOR 24-70mm f/2.8G ED and he the new, used D700. The start of the trip was the Lapeer Depot where we shot whatever we could before the one freight train we saw all day blew by at high speed. 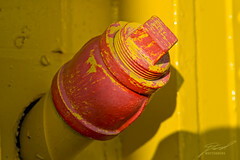 This capped pipe was the port for fuel oil on the end of a caboose. Getting in to a good position to capture this one was tough, but I loved the light and textures.